Ann Marie Pattinson – Admin Asst. The Friend of the Court agents are responsible for providing mediation (an alternative to litigation) with regards to parenting time and custody disputes. The Friend of the Court office also collects, records and disburses support payments and provides enforcement services on custody, parenting time and support orders. For assistance with FOC matters, contact the Milford, Michigan law office of Kathryn Wayne-Spindler & Associates at 248-676-1000. “The Friend of the Court (FOC) is a statutorily created agency of the Circuit Court, which assists the court with its domestic relations docket. 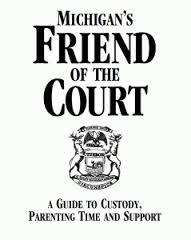 The Friend of the Court assists the court by helping resolve domestic relations disputes, and enforcing the court’s orders for custody, parenting time, and support.” – Washtenaw County Trial Court. “The Friend of the Court provides services to parties with minor children involving divorce, family support, interstate and paternity cases. We are involved if your case is heard by the Circuit Court and if there are minor children involved. Our duties are custody, parenting time, and child support.” – Oakland County FOC. Clare . Gladwin . Grant Township . Harrison . Higgins Lake . Houghton Lake . Midland . Prudenville . Roscommon . Rose . St. Helen . West Branch . Copyright © 2019 Kathryn Wayne-Spindler & Associates. All Rights Reserved.